Wasn't the county of Multnomah. Was the city of Portland. 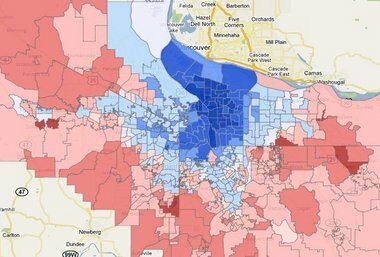 Along the lines of the cool precinct maps the Seattle Times has been posting online the last few cycles, the Oregonian has up one today showing how and where the two candidates won in Multnomah. Dudley won, sometimes narrowly, many of the precincts from Troudale east and south (of course, only limited numbers of people live there); and Gresham was split. In one precinct (5602) south of Gresham, Dudley actually won with 70.3%. But then there are 29 (by my count) Portland precincts that went for Kitzhaber with 80% of the vote or more - all precincts bundled toward the middle of the city, mainly on the east site of the Willamette River. Most of the city's precincts went decisively over 70% for Kitshaber, but the support seemed to radiate outward, fairly precisely, from the river. That tracks over to Washington County (which Kitzhaber also won, but much more narrowly). Kitzhaber's strong precincts were in the Beaverton-Tigard area closest to Portland; away from there, his best precincts were in the community centers (such as central Hillsboro).